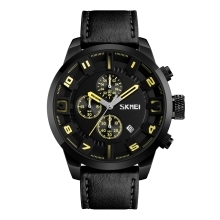 This is a 3ATM water-resistant quartz watch for men. Made form genuine leather band and hard glass mirror. It&apos;s a great gift for your male and female friends. Quartz movement provides accurate time. 3ATM water-resistant (not for swimming, shower, diving). Hard glass mirror, clear to see. Fashionable and casual watch designed for men.